Veeam Backup & Replication is completely controllable by script, and can therefore be incorporated into any cloud management system. When servers are made available in the cloud, backup or replication can be automatically set up taking into account the selected service level. A restore of a virtual server can take place within approx. 5 minutes in the event of an error, and can be controlled from the cloud management system. In the next chapter, you will find further recovery processes that can be carried out directly by the respective server administrators, without them having direct access to backups or the backup server. The recovery of files and application objects can also be carried out by an end user or application administrator via the virtual lab ticket system. They receive NO access to the backup network, backup jobs or backup files. They can also use the one click file restore website to quickly restore individual files. The virtual lab ticket system frees your infrastructure department from time-consuming installation and configuration of test system environments. Together with the U-AIR wizard, responsibility for recovery can be passed to the application administrators trained for each application. Both free up your backup administrator from time consuming application recoveries. 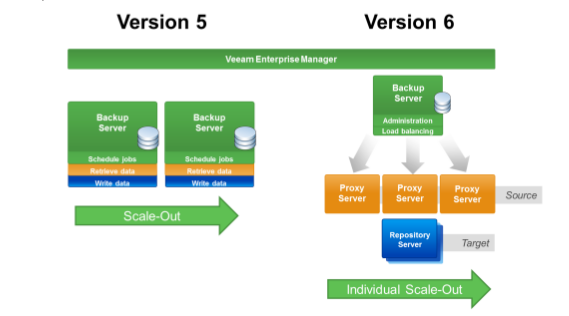 With Veeam Backup & Replication, thousands of virtual machines can be protected. With Veeam Backup & Replication Version 5, further instances were installed for this purpose depending on requirements (scale-out). These can be centrally managed through “Veeam Enterprise Manager”. Jobs are set up on the respective backup server. Backup and replication jobs are allocated and carried out via Veeam Backup & Replication proxy servers – job allocation on the proxy servers takes place through a load balancing and fully-automated best practice process. In the case of backup, data saved by the proxy server (delta to the last backup) is transferred to repository servers which then efficiently store it. In the case of replication, the data is transferred to a further proxy server for storage in a data store. Optimum allocation of backup jobs further reduces the backup timeframe, makes optimum use of backup server systems, and thereby saves hardware (backup servers). The volume of data transferred from the proxy server to another proxy or repository server is the smallest optimum volume of data to be transferred for the backup or replication process. Here deduplicated and compressed data is efficiently transferred over the network or the WAN connection during both backup and replication. Compared with Version 5, which carries out all these function roles on the same server, a further increase in backup and replication performance via WAN or LAN connections is achieved (up to 11x faster). Veeam Backup & Replication can be controlled via Windows Powershell. Along with job control, this command line interface allows the setup of backup, replication, recovery checks and restore processes to be controlled and if necessary integrated into any number of scripts. Veeam Backup & Replication already has a replication function via IP connection built into the standard version. Replication is application and operating system consistent, and is carried out on an adjustable time scale of “monthly, weekly, daily, hourly”, up to a time scale we call “smart CDP”. In “smart CDP”, replication is started again as soon as it is successfully completed. For each virtual server it is possible to specify whether it will be replicated and the time scale in which the replication will take place. Expensive disk storage based mirroring or replication functions or licenses are not required. In Version 6 automatic adjustment of IP and network settings to the replication target and extended options for transferring data back to the main site are available. Only the currently changed data sets on a block level will be transferred between sites (changed block tracking process). The initial replication of the whole data volume can also take place via a removable storage medium, and therefore independently of any available WAN bandwidth. Veeam uses IP connections for replication. This offers high potential for savings, usually in six figures, as there is no need for dedicated SAN cables, SAN/IP routers or disk storage replication and mirror licenses. It is also possible to replicate between different VMware hosts with different disk storage. Further savings potential exists if the data centre is supplemented by the cloud as on demand infrastructure. Here, the virtual servers are replicated via IP VPN connections to a cloud specially set up for you. As the target servers are only started in an emergency, a cost-effective on demand computing power contract can be signed for this. This removes the need to purchase, build and operate a second data center of your own. Critical systems can also be efficiently replicated from external sites to another site via IP WAN connections in order to keep the timeframe between the restore and the last backup/replication status as small as possible. With Version 6 it is possible to automatically adjustment IP and network settings to match the replication target and you have the capability for extended failback functionality (back to the main site with backtransfer of only the dataset delta). In the automatic server creation process, a virtual machine, including operating system, is set up by script. 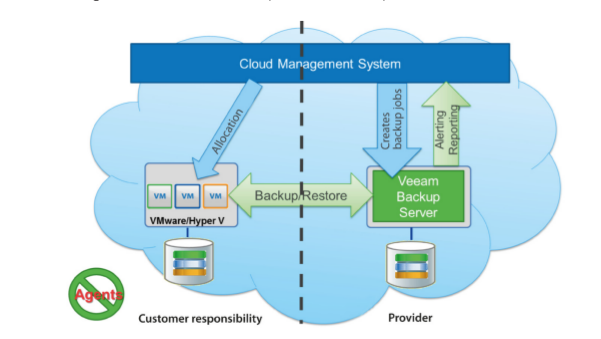 With Veeam Backup & Replication, we offer extremely fast restore from backup together with the secure feeling that recovery will be 100% successful as the recoverability of all backups can be automatically checked. Flexible management, simple operation, application-consistent replication via IP networks and the on demand virtual lab offer massive savings potential while extending the service offering with options that stand out on the market. Integration into existing hardware backup systems allows the budgets invested in them to be safeguarded, and at the same time to achieve additional benefits and savings potential on the other hand. 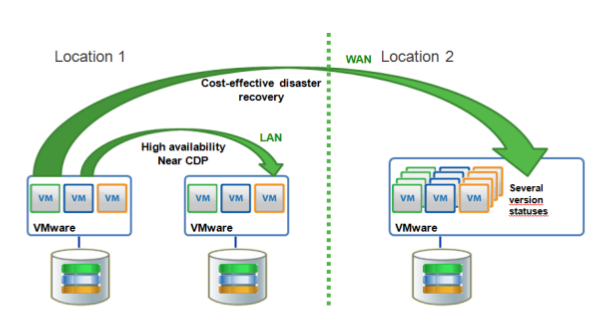 Veeam Backup & Replication used in conjunction with VMware Enterprise functions and current hardware systems offers you THE opportunity to virtualize tier 1 applications securely, flexibly and with additional benefits. Introduce your application managers to the virtual lab – they’ll be thrilled.